A draconian budget passed by Macon-Bibb County commissioners weeks ago zeroed out local funding for libraries, buses and the local department of public health. The stakes are high for public health in Macon-Bibb County, heading into what might be a pivotal meeting over property taxes and public services later this afternoon. Macon-Bibb County may lose $1.5 million in state health funding with its budget passed weeks ago. The North Central Health District learned this week that the budget would leave them without $1.5 million in state health funding. Anita Barkin, acting deputy director for the district, says the shortfall would leave Macon-Bibb without a health department at all. "We are imagining it would be less than a year before that would happen," Barkin says. It would also mean an end to free immunizations for school age kids, health inspections at your favorite restaurant and low cost breast and cervical cancer screenings. The Macon-Bibb County Commission failed to set a new property tax rate after a contentious meeting Tuesday. That means some services could grind to a halt. Local libraries were already within a week of running out of money when commissioners went at each other in a debate over a substantial increase in property taxes Tuesday night. Ultimately, commissioners could find no middle ground and tabled the issue. 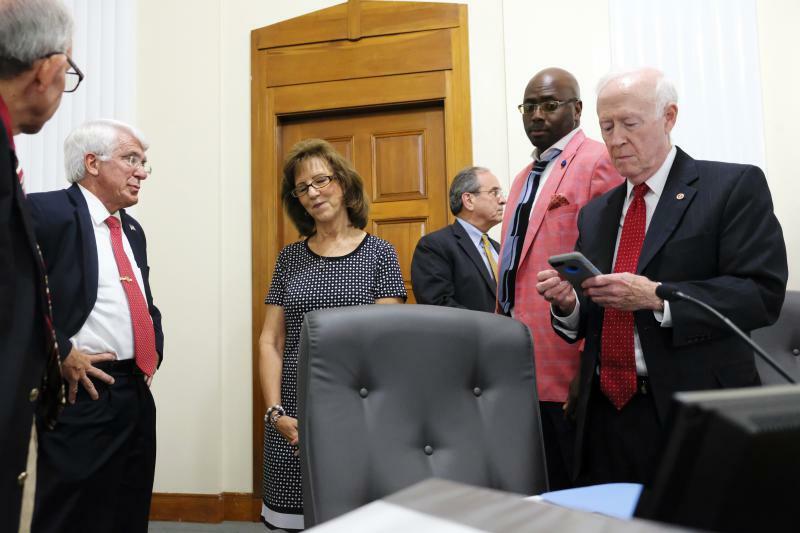 Macon-Bibb County commissioners failed to set a new property tax rate during Tuesday's meeting.